People who visit Alberta’s little all-season town of Canmore (pop. 16,000) have big expectations. Once a coal town, Canmore gained notoriety during the 1988 Winter Olympic Games, and it’s been booming ever since as a recreational hot spot. Just 70 miles from Calgary, Canmore is nestled in Alberta’s Bow Valley, surrounded by mountains and wildlife. It’s the perfect locale for fishing, climbing, canoeing, all kinds of winter sports, and more. Banff National Park is approximately 7.5 miles from your resort, and world-famous Lake Louise is a little more than an hour’s drive away. If you want to take it easy, take a stroll through the quaint town. Its main street is home to galleries where painters, quilters, stained-glass artisans, and blacksmiths can be found at work. 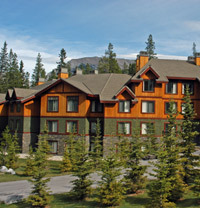 Or just relax in one of Canmore’s many charming pubs or restaurants near your resort. With a little luck, you may even see a Hollywood film being shot here.